By some magic coincidence I met some Latvians on the train (they looked cool and had t-shirts with a strange language print, so I assumed they had to be Latvians. I asked them: and it was true!) who recommended hospitalityclub.org. Check it out: you’ll be amazed. I am fascinated by the idea of connecting people over the internet who offer their places for travellers and really curious how this is going to work. The communication so far with the people I wrote to in Riga has been very friendly and pleasant and I am looking forward to meeting them. 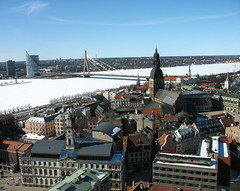 Talk to you soon from Riga!